Tannoy Mercury 7.4 review | What Hi-Fi? The past 12 months have been a rollercoaster for Tannoy, which celebrated its 90th anniversary alongside announcements of redundancies and a factory closure. It’s hard not to think some of that pressure is starting to show. The new Mercury 7 range is likely to have been designed at a similar time to the Award-winning Eclipse 3, but the contrast in performance between them is night and day. The Mercury 7.4s are a pair of budget floorstanders, and the second of the four-strong Mercury 7 range we’ve tested. With 44-litre cabinets aimed at larger rooms, the design is pretty chunky, and they aren’t the most elegant speakers we’ve seen. Their plastic plinths hint at their more budget price point, but we don’t have the same concerns about build quality that we had with their bookshelf siblings, the Mercury 7.2s. They feel sturdy enough and reasonably well put together, and are available in three finishes – black oak, light oak and walnut. The Mercury 7.4s are twin ported, with dual 18cm mid/bass drivers and a 28mm soft dome tweeter. These are positioned in a D’Appolito configuration with the tweeter in the middle, in the aim of widening the traditional sweet spot – pretty important for a speaker aimed at a bigger room. The drive units themselves have also been changed from the previous generation, using new materials to improve their performance, while Tannoy also claims the cabinet construction of the series is the most acoustically neutral to date. It all sounds very promising, but knowing what the company is capable of at this price, we’re left feeling rather disappointed. 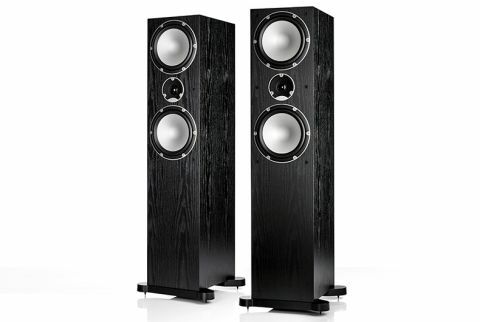 The Tannoy 7.4s certainly live up to the claims of being a big speaker for a big room. Even placed out into the room, there is plenty of scale here, with low, weighty bass that never fails to make its presence known. However it lacks a degree of control, and has a tendency to overpower the midrange, robbing it of clarity and detail. For all its low-end presence, it struggles to put any real kick behind its bass notes, leaving them sounding soft and lacking impact. The White Stripes’ Seven Nation Army falls flat without the punctuation to its drum kicks that defines its melody and gives it momentum. Play something that rests on a strong midrange performance, like the stripped back vocal of India Arie in Ready for Love, and the Tannoys still leave you wanting. There’s not enough detail here to do it justice. You can pick out the breathy drawls that sit on the surface but the subtler nuances that really allow you to connect with the deeply soulful performance are left undiscovered. A lot of that is because the midrange sits back compared to the bass and treble, leaving both of them to fight over which sits more prominently in the presentation. The bass probably wins out, but the lack of refinement in the treble doesn’t go unnoticed either. Snare drums, cymbals and percussion shakers are short on the detail they need to sound clean and natural, and female voices can fizz with a coarseness that doesn’t always make for the most comfortable listen. This trait also makes the speaker feel unbalanced, with the treble, midrange and bass all struggling to pull together and create a cohesive experience, leaving the performance feeling a little disjointed. Perhaps most disappointing though, is that the Mercury 7.4s fail to really grab hold of a track and keep a good sense of timing and rhythm. They don’t get particularly confused or flustered, but lack that level of fluency you find in a more capable speaker. Dynamically they’re a little flat too. You’ll get some sense of peaks and troughs, and the rising and falling of momentum, but only when it’s most explicit. More subtle moments aren’t expressed with the same ability. Q Acoustics’ 3050s are notably better in every respect, and more than justify their £100 premium. It leaves us feeling rather down on the Mercury 7.4s. Compared to their bookshelf siblings, there are more flaws in the treble, which means they aren’t quite as easy to listen to. Big rooms will benefit from their big sound, and if you’re after a booming pair of speakers without a huge outlay you may find your head turned. Ultimately though, the Mercury 7.4s fail to deliver in too many places, and there are much better places to spend your money. Tannoy’s own Eclipse 3s at half the price wouldn’t be a bad place to start, which only goes to make this uncharacteristic misstep even more of a headscratcher.